Éliane Radigue's electronic paeans to Tibetan Buddhism, Trilogie de la Mort and Jetsun Mila featured heavily in my iPod playlist for a recent road trip from Kalka to Leh in the north of India. As my photos show, the road climbs from Kalka on the edge of the Ganges plain over the western end of the Himalayas to reach the alpine desert of Ladakh - 'Little Tibet' - seen in the final photo. En route the road crosses some of the highest passes in the world: three are over 15,000 feet with the highest, the Taglang La pass reaching 17,480 feet. The 500 mile drive took three long days on the road plus one rest day to acclimatise. For the final 300 miles between Manali and Leh the average altitude of the road is 11,000 feet, and it is only passable between May and October. Due to the altitude there is no permanent habitation for 200 miles from Jispa until the road enters Ladakh; the only services are temporary dhaba - road side eateries - such as the one seen in photo 10. 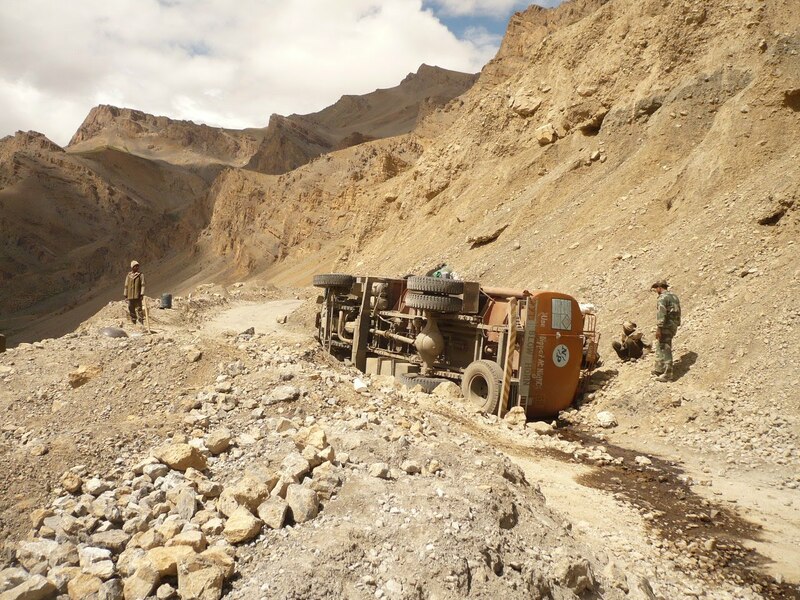 This is the only overland route into Ladakh, and it carries a continuous stream of petrol tankers and military vehicles as the region is of strategic importance as it borders both Pakistan and China. Many glacial streams cross the road (see photo 8), and for much of the last 300 miles the road is unsurfaced and just one-and-a-half carriageways wide, with no barriers to stop errant vehicles plunging down the mountainside. For anyone who, like me, suffers from vertigo and dislikes being driven, the distraction of a well-stocked iPod is highly recommended for this journey. Unfortunately the only alternative way to travel in and out of Ladakh, which is a narrow plateau bordered by the Himalaya and Karakoram mountains, is flying; this is how I returned and it is only slightly less nail biting than the overland journey. Leh is one of the highest airports in the world and, because of nearby mountains, has one of the very few unidirectional runways. This means planes can only take-off and land in one direction irrespective of the wind direction; this compromises the ability of aircraft to climb quickly, which is somewhat disconcerting when taking off from an airport surrounded by the world's highest mountains. On top of this the airport can only be used in the morning due to the strong mountains winds later in the day - some bloggers will do anything for a good story! Also on Facebook and Twitter. All photos (c) On An Overgrown Path 2014. Any other copyrighted material n these pages is included for review or critical analysis only, and will be removed at the request of copyright owner(s). My travel arrangements in India were made by the Tahi Lhunpo Monastery UK Trust, but any views expressed in this post are strictly my own. Thanks so much for all these photos! You have a terrific eye for the camera. In some sort of synchronicity, my friend Lama Tashi is visiting here from India for the first time in years - and coming home from Dulles airport he took a short video as we drove along, and I asked him why. He said to show people back in India how good the roads are here, compared to what you're showing in these pix. Wishing you continued safe travels. "The dogmas of Max Hole" as also regurgitated in yesterday's Guardian by a somewhat befuddled Tom Morris, a theatre director turned world-famous authority on classical music, hence, I must think, his appointment as Artistic Director of the Bristol Proms, even if he appears not to know which movement of Mahler's Third Symphony educed applause from the audience at one of the composer's own concerts.